The Nevis Island Administration Cabinet meeting. 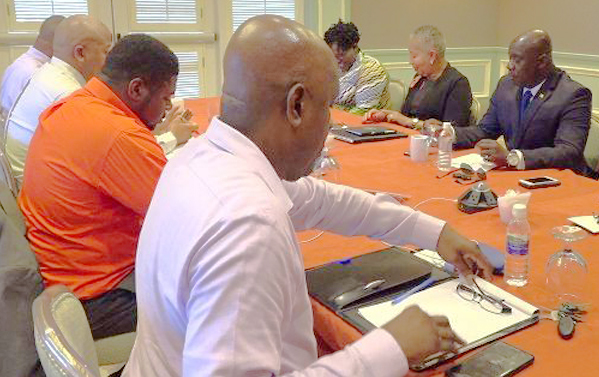 CHARLESTOWN, Nevis -– Activities and projects underway in various ministries, their concerns and goals, were discussed during the Nevis Island Administration (NIA) Cabinet’s retreat on Aug. 21 at the Four Season’s Resort. This retreat was the first such activity held since NIA took office in December 2017. At the start of the retreat, Hon. Mark Brantley, Premier of Nevis, said the session was moved from the usual Cabinet Room at Pinney’s Estate to provide a more enabling and less formal ambience for discussion. “We hope that today we will be able to discuss various things, not just in the usual Cabinet format but also to discuss issues of where we are in our respective ministries, where we are in terms of the cohesion of Cabinet and what we do, how we can do what we do better.” the Premier said. The Premier noted the retreat is the first of many as they endeavour to take the Cabinet to the next level in an effort to better serve the people of Nevis. Present at the retreat were Deputy Premier Hon. Alexis Jeffers; Senior Ministers Hon. Eric Evelyn and Hon. Spencer Brand; Junior Ministers Hon. Hazel Brandy-Williams and Hon. Troy Liburd; Cabinet Secretary Stedmond Tross and Legal Advisor Mrs. Hélène Anne Lewis.